The initial specifications planned the construction of 5 space shuttles for a frequency of 30 flights a year. At the end of the 60s and at the beginning of the 70s the USA began to study the possibility of doing hostilities in space. In the USSR this idea appeared in 1976 from the instigation of the Central committee of the Communist Party of the USSR and the Cabinet of the USSR (Study of the possibility of creating a weapon for the conducting hostilities in space). The works were entrusted to NPO Energia. In the years 70-80 were led the studies with the aim of defining the tasks to annihilate military spaceships, missiles in flight, as well as air, ground and maritime objectives, both at the level of the means of production and financialy. 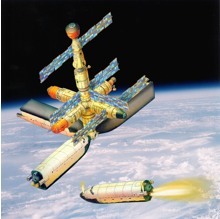 2 spaceships was elaborated on a common base to fight spatial military objects, equipped by various types of weaponry, laser (as "Skif") or of rockets (as "Kaskad"). 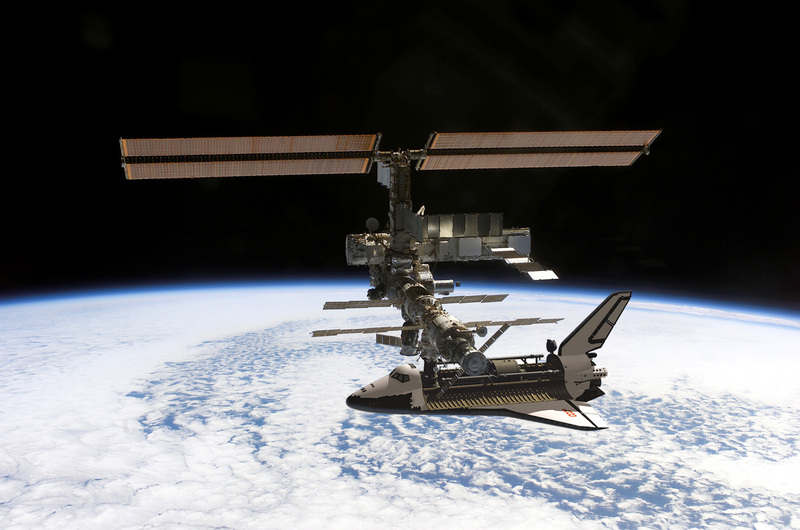 The base of 2 devices became the unified block of service for the orbiting combat space station Polyus 17К ДОС. Unlike the station, the service block had to contain a large number of fuel tanks to be able to make numerous operations in orbit. Because the "Kaskad" vessel is lighter than "Skif" (the laser armament is very heavy) allowed this vessel to take more fuel. Besides, the Kaskads vessel must be put into orbit on a low orbit, whereas the second must be put on an average or geostationary orbit. To destroy the enemy missiles quickly and their warheads, NPO Energia planned the use of "Kaskad" and its antimissile rockets. According to other sources the "Kaskad" vessel was elaborated by the company of A.E. Nudelmana supervised by NPO Energia. The putting into orbit of "Kaskad" had to be made by the Progress vessel. 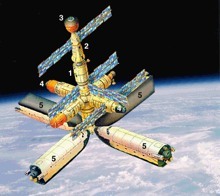 Five flights of "Kaskad" were planned for the first stage 1986-88. The factory of the experimental mechanical engineering industries (ЗЭМ) began the manufacturing under the numbers 129, 130, 131, 132, 133. However the project did not reached the flight tests. Vessels are renamed and in 1990 the project is closed. The company responsible for the creation of the laser was "Astrophysical" NPO - Soviet general company of lasers. After the transfer of "Skif" from NPO Energia to KB "Salyut" at the beginning of the 80s the heavy combat station "Skif" is elaborated. In august 18th, 1983, General Secretary of the Central committee of the Communist Party of the USSR Iury Andropov makes the demand that the USSR stops the develKaskadopment of all the space defence systems. However, because of the americans started their strategic project of defence (IDS) the works on "Skif" continued. On May 15th, 1987 the station "Skif-DM" of about 80 t is launched by Energia LV, but gets damaged offshore due to a failure of the propulsion system. Legend: 1-Base bloc; 2-Management centre of the combat blocs; 3-Transport ship "Dawn"; 4-Combats modules; 5-Combat modules made from Buran. 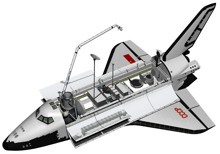 Legend: 1-Fixation; 2-Nose part of the fuselage; 3-Air-lock of transshipment; 4-Hermetic cabine; 5-Bloc engines fronts; 6-Middle part of the fuselage; 7-Rear part of the fuselage; 8-Panel of the payload bay with the thermal heat exchangers. As experiments for the second flight it was planned to study the conditions of micro-atmosphere and the characteristics of the irradiations. These experiments were considered as very important. The great energy possibilities of Buran (60 kW) and the level of micro-gravitation (10-4 10-5 g) as well as the other technical characteristics allow to organize on board the industrial production and the delivery on Earth of bio-preparations and semiconducting devices of high cost, such as projects of bio-installations ("Rekomb-2 ", " Brook-2", "Potok") and technological installations ("Crater - АГ", "Malachite"). 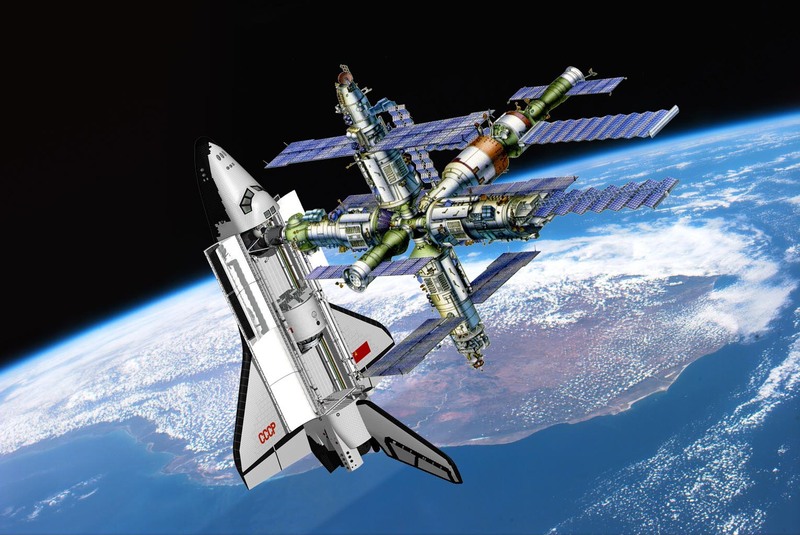 In May 1974, a large of the Soviet space took place which led the Buran half of project. Vasiliy Mishin, who the chief designer at influential TsKBEM design bureau, unceremoniously fired while he in the hospital. TsKBEM with Valentin Glushko's KB bureau to form the new Energia Scientific Production (NPO Energia). 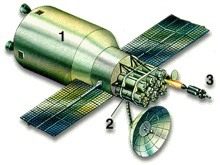 Glushko then over this huge new supervising virtually all Soviet spacecraft, launch vehicles, and satellites. Famed Soviet rocketry Sergei Korolev had founded seed of NPO Energia, now Glushko had even power. As one of first official acts, the Glushko signed an order all work on the and associated lunar projects. a single stroke, Glushko cancelled Mishin's grand plans space exploration. Glushko was interested in a new launch vehicle. Despite many scenarios, it was unclear the prime goal or for such a vehicle be. 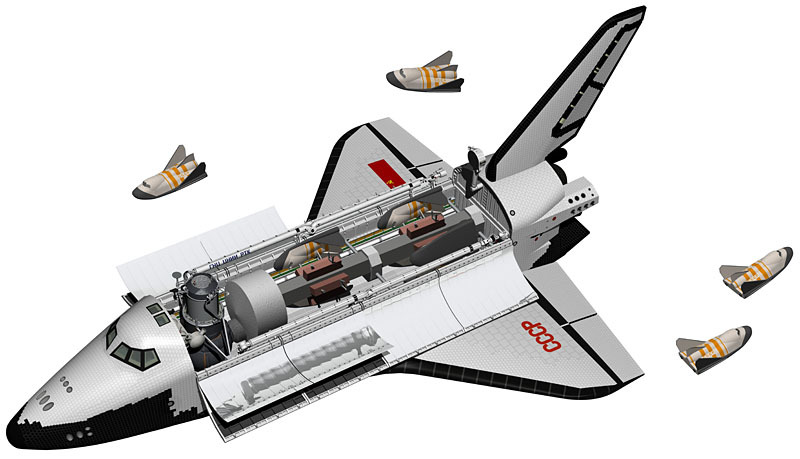 Nevertheless, designers began initial work on what the Energia launch vehicle 1974. Soon, however, the found a purpose for a vehicle.